Franyelis, 8, feeds her baby brother Joneiber as their mother Francibel Contreras holds a bowl of scrambled eggs and rice, at a soup kitchen in the Petare slum, Caracas, Venezuela, Feb. 14, 2019..
Jorge Flores practices his hairstyling skills on his mother Rosa Vega inside his home, where he is trying to set up a barber shop in the Petare slum, in Caracas, Feb. 14, 2019. So Flores abandoned the market stall and looked for other work. 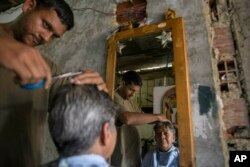 He does some plumbing jobs and the family has turned its living room into a barbershop, sheltered beneath a corrugated metal roof held down by loose bricks and planks. It's decorated with origami-like stars that the family has made out Venezuela's colorful but rapidly depreciating bolivar bills. 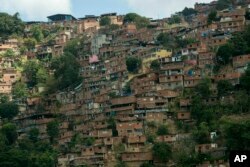 A portion of the Petare shanty town, one of Latin America's largest slums, is seen in Caracas, Venezuela, Feb. 14, 2019. 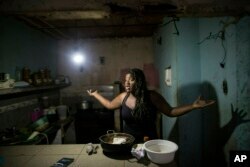 Dugleidi Salcedo complains to a neighbor about the high price of food as she prepares arepas for her three sons in her kitchen in the Petare slum, in Caracas, Feb. 14, 2019. "It's a social earthquake," Bolivar said. "They lose their homes. They're left in the open air. The soup kitchen was robbed. It's so many adversities: It's the infections, the lack of water and food." 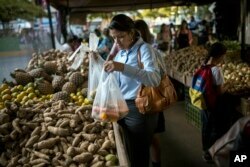 Carmen Victoria Gimenez, 43, shops at a farmers market in the middle-class district of Los Dos Caminos, in Caracas, Venezuela, Feb. 14, 2019.